Whiteflies and the viruses they carry have been a large, complex and economically significant problem for cotton growers throughout the world. Whiteflies pick up viruses from a range of host plants near cotton fields, transmit them to cotton plants, and can continue to do so throughout the rest of their lifetime. In the cases of cotton leaf curl virus and cotton leaf curl disease, this ends with all-too-common results: the curling of leaves and/or the development of leaf-like enations on the undersides of leaves, overall stunting of the plant, and reduced yield and quality. In the latest ‘Focus on Cotton’ webcast, titled "Begomovirus-Whitefly Vector Complexes: Emerging Threats to Cotton-Vegetable Crop Biosecurity," Professor Judith Brown from the University of Arizona educates growers, consultants and applied scientists worldwide about the ins and outs of begomoviruses, the cause of cotton leaf curl virus and a key component of the cotton leaf curl disease complex. This presentation focuses on the characteristics and history of cotton leaf curl disease, the diversity and distribution of the many begomoviral species and strains that comprise the complex, and the origins and extent of recent spread leaf curl virus. The talk also highlights measures that should be taken to safeguard cotton crops, including monitoring and reporting suspicious symptoms, particularly when the whitefly vector is or has been known to be present, and continuance of efforts to develop virus-resistant varieties for deployment in high risk areas. This presentation will be of particular interest to producers, plant breeders, consultants and plant pathologists who work with cotton, as well as those involved with vegetables and ornamentals, which are also common whitefly hosts. 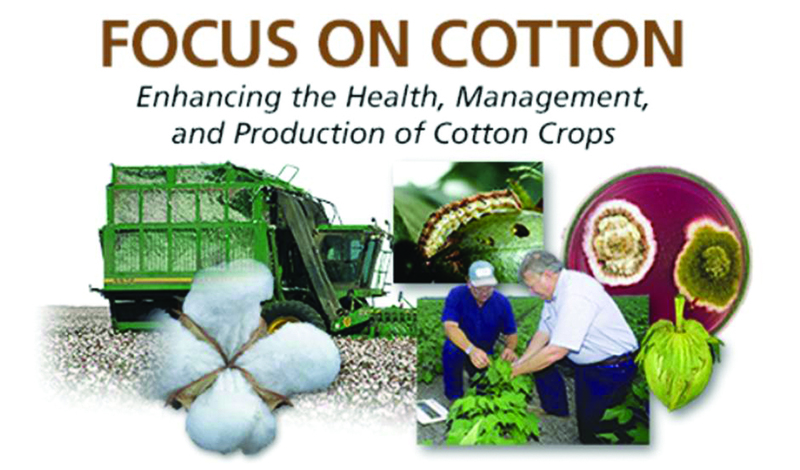 The ‘Focus on Cotton’ resource now contains nearly 30 webcasts on various aspects of cotton crop management. These talks, freely accessible 24 hours a day, 7 days a week, cover agronomic practices, crop protection and ag engineering. ‘Focus on Cotton’ also features a new and improved Cotton Extension search tool, where users can conveniently search for extension resources across all universities serving cotton producers. All of these resources are freely available courtesy of Cotton Incorporated at http://www.plantmanagementnetwork.org/foco. Here’s some good news for retailers just in time for the holidays, according to Cotton Incorporated’s Lifestyle Monitor Survey, consumers say they plan to spend 20 percent more on clothing this holiday season. T-shirts made of 100 percent cotton are at the top of the shopping list for 56 percent of those who responded to the survey. Other top items include sleepwear, jeans and sweaters. 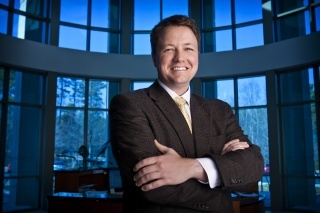 The Holiday Shopping Trends for 2014 publication shows consumer spending is expected to rise to an average of $589 per person, which is an $80 increase from last year. "Retailers can win by providing quality cotton clothing that holiday shoppers seek in-store and online," Cotton Incorporated’s Lifestyle Monitor Survey finds. 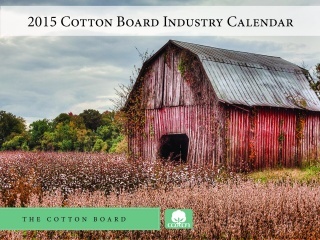 The much-anticipated 2015 Cotton Board Industry Calendars are nearing completion and are set to ship in mid-December. This calendar is a great resource for cotton industry meeting dates and information on the Cotton Research and Promotion Program. We would like to extend a sincere thank-you to the sponsors of our 2015 calendar: Acala Farms Flavored Cottonseed Oil, BASF, Bayer Crop Science, Helena Chemical, Plaza Transportation Co., Staplcotn, the Southern Cotton Ginners Association and T.J. Beall Company. The Cotton Board would not be able to produce this calendar without their sponsorship and invaluable ongoing support of the Cotton Research and Promotion Program. 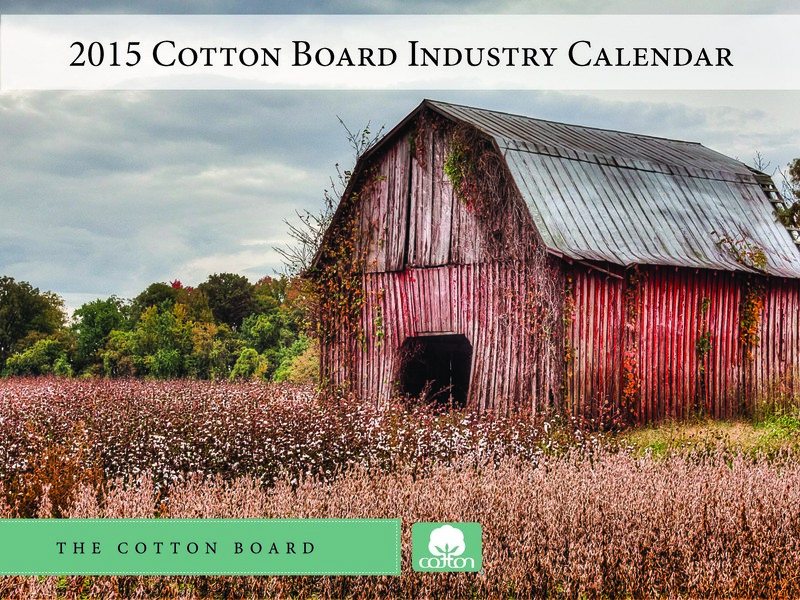 The Cotton Board calendar is set to ship in Mid-December. Cotton’s 24 Hour Runway Show, a fashion fete presented by Cotton Incorporated in partnership with PEOPLE magazine was held November 7-8, 2014 on Miami Beach’s iconic Ocean Drive, and officially set a new Guinness World Record for the "Longest Fashion Show" based on length of time. The show featured a different cotton outfit every minute for 24 hours totaling 1,440 cotton outfits. With the help of more than 50 hair and makeup artists, 60 models walked a combined 96 miles on the runway in the finest cotton styles. More than 75 brands and retailers participated and 1.2 million online viewers logged on to watch the live stream of the event and plan their most memorable cotton looks. To find out more visit: ww.thefabricofourlives.com. After decreasing in early October, Chinese prices have been stable. NY futures and the A Index were relatively unchanged over most of the past month, but have lost ground recently. March overtook December as the contract with the largest amount of open interest. March prices have consistently traded at a slight discount to December, and had held to values between 61 and 64 cents/lb for the past couple months. In recent trading, March prices dropped below 60 cents/lb. The A Index also shifted slightly lower, moving from levels around 70 cents/lb to those near 66 cents/lb. There were few significant revisions to estimates in this month’s USDA report. The world production figure rose 237,000 bales, increasing from 119.4 million to 119.6 million. The global consumption figure rose 175,000 bales, increasing from 113.7 million to 113.9 million. With this month’s revisions to world production and consumption nearly equal, an addition to beginning stocks that resulted from historical revisions was a primary reason for the 249,000 bale increase (to 107.4 million bales) to the global 2014/15 ending stocks number this month. The U.S. production number increased 142,000 bales, to 16.4 million bales. The projected U.S. carryout increased 200,000 bales to 5.1 million (versus 2.5 million for 2013/14). Globally, the planting outlook for next year’s harvest is complex. Since the onset of the 2012/13 crop year, there have been important declines in corn and soybean prices. The drop in prices for crops that can compete for cotton acreage reduces the likelihood of an exodus from cotton when the planting season arrives this spring. Nonetheless, recent declines in cotton prices could be expected to result in important reductions in acreage in certain cotton producing countries. The magnitude of any shift in global cotton acreage could eventually emerge as a factor affecting cotton prices. However, with world stocks at record levels, and with indications from the Chinese government that reserves would be released in response to upward price pressure, it could take several years for acreage-related forces to drive price direction. The amount of time it could take acreage-related factors to affect prices will be a function of developments on the demand side of the balance sheet. A principal uncertainty in the current crop year is the strength of the potential recovery in cotton’s market share relative to synthetics. At the world-level, cotton prices are competitive with those for polyester. Although the gap has narrowed considerably, cotton still commands a premium over polyester in China. With China being the world’s largest consumer of both cotton and synthetic fiber, the changes in share that occur there will be influential on the change in share that occurs globally.